Old hand drawn Bollywood movie poster of the hit Hindi film Anarkali (1953) for sale. This is an original old hand drawn Bollywood poster of the 1953 historical drama that starred Pradeep Kumar and Bina Rai in lead roles. Anarkali was one of the biggest Bollywood hits of the 1950s. 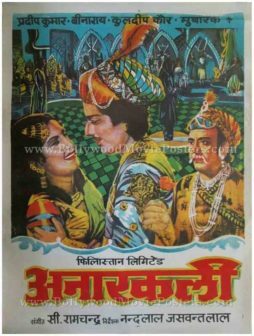 Another film based on the same theme was the cult hit Mughal-e-Azam which followed in 1960, making this hand drawn Bollywood poster highly collectible! Printed and circulated a couple of decades after the first release of the film (early 1970s), this hand drawn Bollywood movie poster was originally designed for publicity of the re-release of the film but never ended up being used. This Bollywood poster features quirky hand drawn artwork. The three lead actors are seen in quirky hand drawn portraits set against a palace background. Courtesan Anarkali played by Bina Rai is seen in a hand drawn avatar romancing Jahangir (played by Pradeep Kumar), while emperor Akbar (played by actor Mubarak) is seen holding a rose alongside. 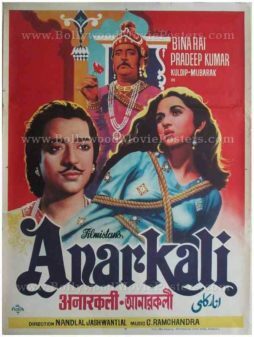 Anarkali is a 1953 Bollywood historical drama based on the legend of Mughal emperor Jahangir who revolted against his father Akbar over his love for a courtesan called Anarkali. Very rare, original vintage Bollywood movie poster of the hit Hindi film Anarkali (1953) for sale. This is an original old Bollywood poster of the 1953 historical drama that starred Pradeep Kumar and Bina Rai in lead roles. Anarkali was one of the biggest Bollywood hits of the 1950s. Another film based on the same theme was the cult hit Mughal-e-Azam which followed in 1960, making this poster highly collectible! Printed and circulated a few years after the first release of the film (early 1960s), this hand painted Bollywood movie poster was originally designed for publicity of the film but never ended up being used. This Bollywood poster features stunning hand painted artwork. The three lead actors are seen in beautifully painted portraits set against a red background. The stark contrast between the rose and the restraining ropes on actress Bina Rai (who plays the role of Anarkali in the film) give away the Love and War plot of the historical drama.